This year, our Barn Swallows arrived in early May, but didn't start nest building until last week. We have an old nest under the peak of our roof that's been used since 2002, but this year, the pair wanted to build a nest under the porch. That would have been terrible, so we discouraged them by stuffing the nooks and crannies with newspaper. After a few days, we saw them starting a nest at the back of the cabin. It isn't a perfect spot, but we didn't want to delay their nest building any longer. Bert IV and his Lovely Lady are working hard to get the job done so they can start their family. Each time they fly in with a beak full of mud or grass, the nest gets larger. Because it's lower than the peak of the roof, I'll be able to get even better pictures as the summer progresses. One thing I love to grow is taters. We like to eat them baked, fried, mashed, hashed -- well, you get the idea. There are so many ways you can fix and eat this nutritious, easy to grow, tasty tuber. I grow my potatoes in barrels around the cabin deck. I have two varieties, Norland Red and Yukon Gold. Of the two, the Golds are the best keepers through winter. After harvesting, I save my taters wrapped in newspaper in open baskets in my downstairs "root cellar" under the bed where it's dark and cool with little danger of freezing. I save some of my crop to become seed potatoes. By planting time, they've grown nice sized eyes. Small taters get planted whole, larger ones get cut making sure there are several eyes on each piece. I let the cut edges dry before planting to prevent rot. I put several inches of potting soil at the bottom of each barrel, place the potatoes on top, and then add several more inches of soil. After the plants break through the soil, I add more potting soil or peat moss. I do this several times until the soil comes within a few inches of the top of the barrel. This encourages the plants to generate more taters all the way from the bottom to the top of the barrel. Potatoes are a great thing to grow even on an apartment or condo balcony if you get good sunlight. All you have to do is bury, water, and periodicallly give them a little all-purpose plant food. They even make a lovely plant for the summer months. After the foliage withers, the taters are ready to dig. If you can't wait that long, carefully reach under the soil and take a few to enjoy with an early season dinner. Okay, technically they live here, but not all year long. The Canada Geese are back and pairing up. Two that have taken up residence in the Hole in the Wall come by frequently looking for handouts. I never tire of watching the sky from our cabin deck. When we lived near Los Angeles, California, the sky didn't attract my attention as much. Each day was much the same as the one before. Up the lake, the sky changes daily, hourly, by the minute. Looking south, I saw herringbone clouds over the treetops. Folklore says, "Herringbone sky, neither too wet nor too dry." You can see why it gets the herringbone name. The clouds look just like the bones of the tiny fish that's an important part of the ocean's food chain (see this article about a herring spawn here in Powell River). A little over two years ago, we brought home a tiny fir tree a little over two years ago. Along with it came a small hemlock. They both fit into a small flower pot, but the hemlock didn't make it through the first winter. This spring I transplanted the fir into a larger pot, just in time for the growth of new spring shoots. Tiny buds developed on branches and the growing tip. Slowly, they started to open. Bundles of needles exploded into brilliant green pom-poms. From here, they will extend up and out into new branches and added height. I like having a spot of green and a hint of the forest on our front deck. In April, we got a 24" television to use at the cabin as a large monitor for Wayne's laptop so we could watch (and hear) movies better. Now that TVs are so thin and light, it was easy to find a place for it. When we use our mini-entertainment center, we carry it, on the homemade stand John made for us, and put it right in front of the sofa. But when it's not in use, we store it along the wall next to the stairs. For protection, we store it with the screen facing the wall. I wanted something more to keep off the dust, and to give it greater protection. I purchased a tablecloth at the thrift store over a year ago, and now I had a use for it. This week the moon has been spectacular. On clear nights its benevolent countenance has shown down us with a brilliant luster. But on other nights, clouds arrived just after sunset. These rocks are found on Hardy Island in Coastal BC. They have such an unusual vertical nature. An intrusive dike visible at the water's edge. I've been up at the cabin for almost a week, and it's been a very productive one. The weather has been sunny and warm, interspersed with light rain. Perfect for starting my gardening for the year. A month ago, I worked up my float garden soil and dug in steer manure to replenish some of the nutrients that were washed away during the heavy winter rains. I planted all four beds with lots of veggies we like to eat: spinach, ruby chard, curly kale, lettuce, beets, and onions. This year I am skipping strawberries. They take up too much space and haven't produced well lately. Time to give the soil a rest and change. Everything is ready and set to grow. I can hardly wait for my first June harvest of baby greens. p.s. Thanks Susan for highlighting my floating garden on your blog last week. It was fun to share with your readers. I'm always on the lookout for new recipes. Wayne and I have been eating flax in cereal and muffins. Flax bread sounded like another way to use this nutritious food. Combine whole wheat flour, 1 cup of all purpose flour, yeast, and salt in a bowl. Heat milk, brown sugar, honey, and margarine in a pan until blended. Cool slightly. Mix the dry and wet ingredients together. Stir in ground and whole flaxseeds. Add enough all purpose flour to form a ball. Turn dough out on a lightly floured surface and knead for 6-8 minutes until elastic. Dust more flour onto the surface as needed to keep the dough from sticking. Grease a bowl and roll the ball of dough in it to coat all sides. Cover the bowl with a towel and place in a warm place to rise until double, about one hour. Punch down, then turn out on a lightly floured surface to form into a loaf. Put dough into a 9X5" loaf pan coated with cooking spray. Cover the pan with a towel and put it in a warm place to rise until double, about 30 minutes. I like this recipe because it makes one loaf, just enough for the two of us. Bake at 375 degrees Fahrenheit for 35-40 minutes or until golden brown. I was approached by Kristen Mitchell from RVWest magazine recently. 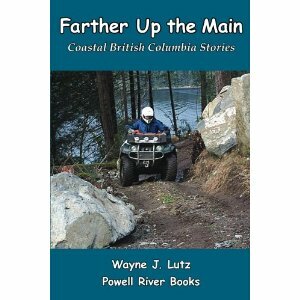 She was doing an article for her readers about Powell River and Lund. Because of my blog, she thought I would be a good source for information about our region. "Loving life on B.C. 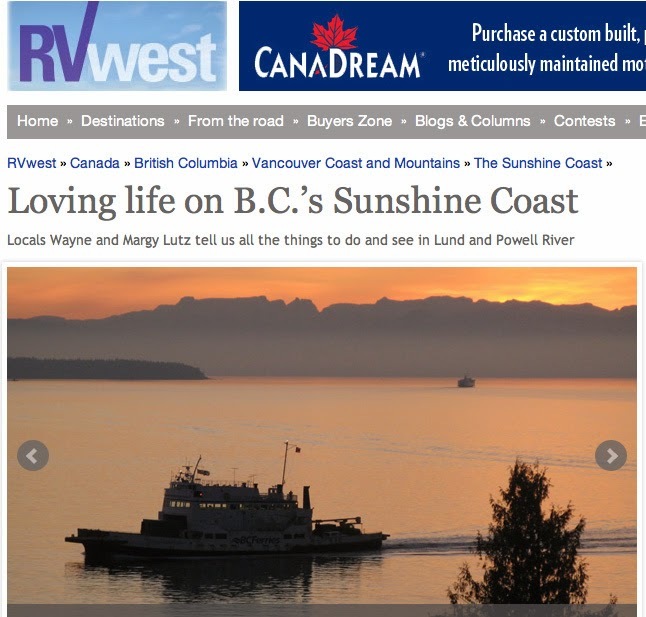 's Sunshine Coast" can be read by clicking here. 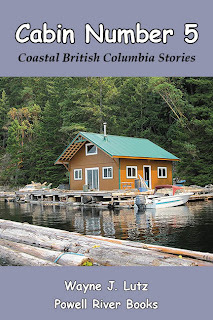 Wayne and I discovered Powell River and our float cabin home as tourists. 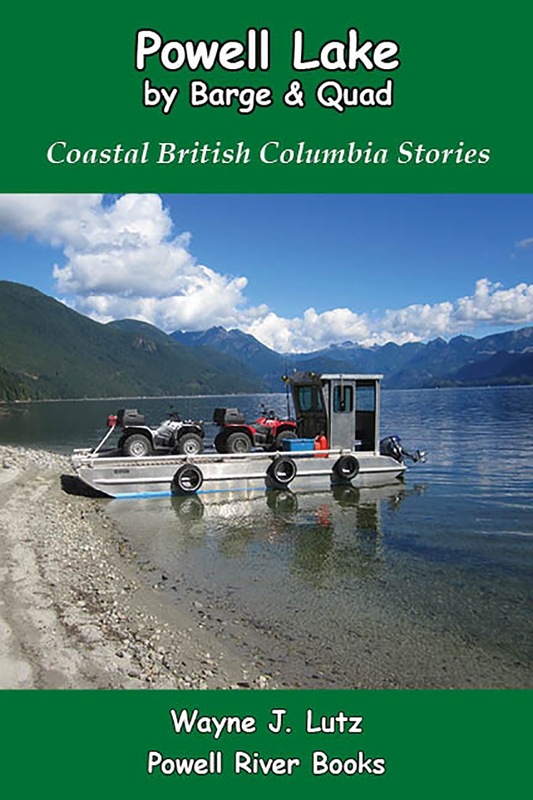 The Powell River region has so much to offer: nature, outdoor activities year-round, wonderful people, a strong sense of community, and a great place to live. Who could ask for more? We took an early spring trip to the Head. From our cabin it's about 16 klicks (10 miles) by boat to the beginning of Powell Lake where the Powell River enters. We hoped to see roaring waterfalls and mountain goats on the lower cliffs, but found neither. I'm sure we didn't look hard enough for the goats. I don't think they've moved back up to the snowy high country yet. I guess the lack of rain and cooler weather held back the spring runoff. While we've only had a few mice get into the cabin, they are constant "companions" outdoors. We have two places that are problematic. One is our electrical closet at the back of the cabin. It houses our inverter and batteries with lots of chewable wires. There's also a cut through the cabin wall for an indoor control lever that's a worry. The other location is our outdoor garbage pail. It's sealed, but mice have to explore the lid every night and leave their "calling cards" to let us know their displeasure at the locked entry. We want to evict them from both locations as soon as possible. Recently I read a book that suggested scented dryer softener sheets and mothballs. Even though they say it's an old wives tale, I figured it was worth a try. We poured a third of a box of mothballs down the opening between the studs in the electrical closet and stuffed dryer sheets around the opening. For my garbage pail I made mothball "party favours" wrapped in dryer sheets. At both locations the mice have stopped their nocturnal visits. It probably isn't a solution for a large area, but for localized spots it seems to work. I know I will need to refresh the supply periodically as the mothballs disintegrate and the dryer sheets loose their oomph. WARNING: Chemicals in mothballs are dangerous. Follow directions, and don't use them near children and pets. 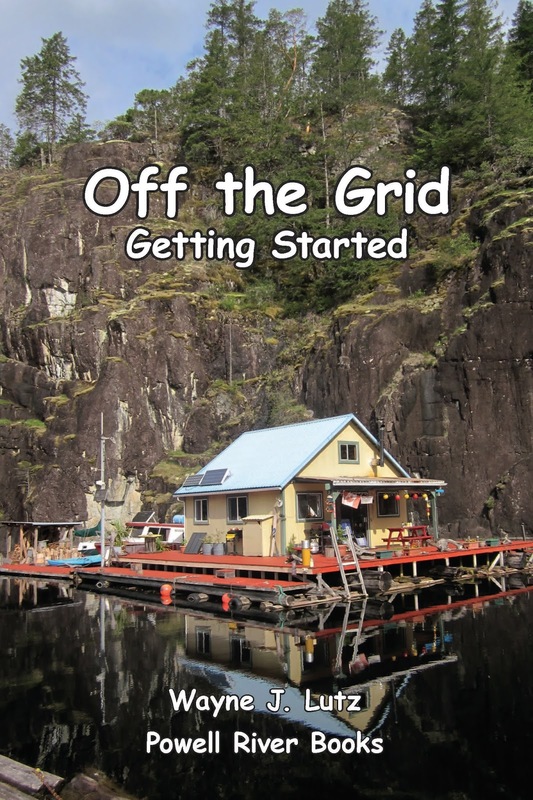 Head on over to Susan's blog As Long As You Have a Garden today and you will see a post about our floating garden up at the float cabin on Powell Lake.